I'm not exactly sure of the storyline, but I'm thinking it involves alot of clandestine wheeling-and-dealing....AND AWESOME BELLY BLOWS!! Heyyyyaaaaaaaaah! I Samruai Lawyer! Heyyyaaaaaaaaah! I fight for you! Auuugh! Cut through red tape. Auuugh! Slash opposition! Heyuah! Call 1-800-fat-slob for free consultation! We have financing! Habla Espanol. Aughhhhhhhh!!! and no one has been able to budge him. Chief Deputy Wilson Roundtree is beefing up at the local buffet but few see much chance of him settling the matter without assistance form the Feds. Samruai Lawyer is threatening to file a discrimination complaint against the judge if she doesn't back off the dress code in his case, claiming it is part of his firms trademark, motto (one call that's all) and important for the proper attitude of potential jurors. Developing. I'd say its more of a sumo wrestler there. The Ellipsis beat me to the punch. "You take dear, round eye...aw ah you grutton faw punishmen?" Niiiiiice. That's why I do this crap, YOU GUYS CRACK ME UP!!!! 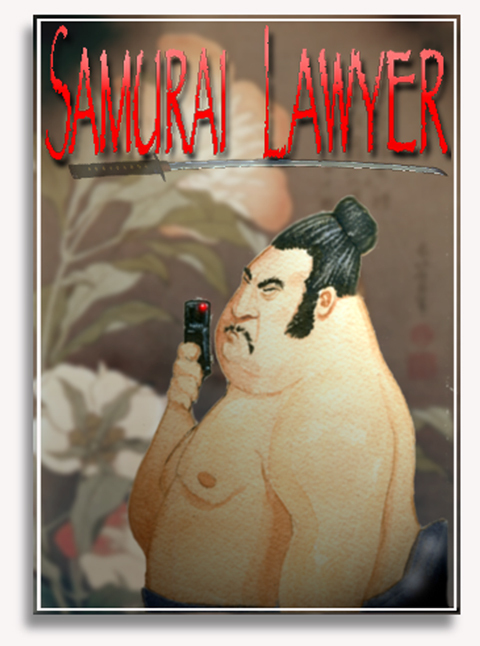 Samurai doesn't seem to pleased with the smell of his phone.....where does he keep that thing anyways? "Why they make buttons so smarr? It's too hahd faw fingas to press them!" "Say 'Herro' to my ritter frien? Arr my friends ritter compare to Sumo Rawyer!!!" We promise to free Mark Steyn if you will appear in court wearing a pair of pants. "Buttons so smarr...So hod to diar numbah faw Itarian take-out so I can road carbs faw great case against McDonards faw making me fat...aftah great victory thanks to stupid American jury, maybe I could get dear with Sushi Hut to be nex Jarrod!" Hey John, when did you take my picture? This page contains a single entry from the blog posted on June 7, 2008 6:07 PM. The next post in this blog is Zee Lone Saucier.